Menstruation, the most natural bio-physiological phenomenon in a woman’s life cycle, is considered dirty and impure throughout India. This is reflected in the way the entire concept of Menstrual Hygiene gets handled. The shame, the secrecy, lack of access to clean pads or toilet facilities further adds to the challenges. The implications are deeper and more pervasive than any statistic can attempt to portray. Issues such as lack of awareness, lack of access, and unaffordability force approximately 300 million women to rely on old rags, plastic, sand, and ash to address their sanitation needs during their menstrual cycle. Reproductive Tract Infections are 70% more likely in women who use unhygienic materials during their periods. Currently, only 12% of women in India use sanitary napkins to manage their menses. Some of the most detrimental implications of the current menstrual hygiene state in India affect both education and livelihood. In India, adolescent girls (age 12-19) miss five school days in a month due to menstruation. Around 23% of these girls actually drop out of school after they begin menstruating. This hinders one quarter of the next generation of India's female population from pursuing higher education. Similarly, women in India are forced to miss roughly four working days a month resulting in forty-eight days of lost income in a single year. The ramifications of this loss manifest themselves in everything from food availability to health and the larger space of women empowerment. While the Indian media has recently opened up to conversations about menstrual taboos, access still remains a major issue. 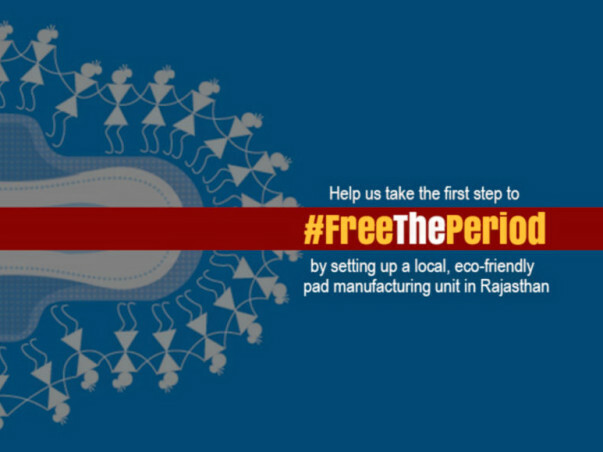 Rajasthan remains one of the poorest states in terms of access to hygienic menstrual products. In a report by J. Senthil found that only 13.7% use sanitary napkins, and that there is a huge rural-urban divide. Only 36% girls in the urban and 54.88% girls in the rural area were using homemade sanitary pads and reused the same in the subsequent period. The Better India is coming together with Aakar Innovations to set up sanitary pad mini factory in Ajmer, Rajasthan, that will employ local women to manufacture and distribute bio-degradable, low-cost sanitary napkins. The solution will endeavour to break the silence around the issue of Menstrual Hygiene and provide knowledge and guidance to all stakeholders, especially adolescent girls. The idea is that something as natural as Menstruation does not become a thing of shame, adolescent girls have access to pads, know how to use and dispose them, while the community and institutional systems are sensitised and support them in this process. The eco-system will be created using ICT (Information Communication Technology) and Sports, so that they can come out of the four walls to discuss about MHM (Menstrual Hygiene Management) openly. The idea is to empower women locally to produce and distribute affordable, high-quality, 100% compostable sanitary napkins within their communities while simultaneously creating livelihood opportunity, raising awareness and sensitization of menstrual hygiene management. Aakar believes in a multifaceted approach to ensure sustainability which includes livelihood creation, product promotion, and community awareness for a complete and sustainable Menstrual Hygiene solution. This model is an unique combination of empowerment and livelihood generation that inherently promotes financial growth incurred by the economic base of the pyramid. Aakar intends to set up sanitary napkin production unit in slum areas and create demand for the same. While the manufacturing unit helps to generate employment for 12-14 women directly. Simultaneously another group of community members, mainly women would lead the behaviour change programme in the vicinity. Aakar strongly believes that a true long-term change can materialize only if an initiative is community led and driven. However, to catalyse change at a community level there needs to be an ecosystem that can tackle its own problems as well as be able to eradicate detrimental health practices. Aakar proposes to drive this ecosystem by empowering women to not only run their own micro­ business ventures, but also act as agents of change in their own communities by increasing the availability of napkins and ensuring that behaviour and practice are changed thereby ensuring lasting change and making the livelihood venture a sustainable one. Aakar would provide the machinery, raw materials and training to the local women on entrepreneurial skill development. It will also create market linkages through Aakar’s Village Level Entrepreneurs (VLEs). Finally it will work with a plethora of stakeholders in the community to impart behaviour changes messages around menstrual health and hygiene at the grass root level thereby ensuring sustainable micro-enterprises. Aakar will provide an extensive 1 week training to the unit supervisor in the training centre which will discuss everything from sanitary napkin production to unit economics and reducing waste in the workplace. Additionally, Aakar will provide a five day training to each of the unit workers which will cover the production process, basic maintenance, etc. The unit will begin production under the supervision of Aakar staff. The setup will simultaneously create lasting livelihood opportunities as well as market linkages by identifying and training local community women to work as Village Level Entrepreneurs (VLEs). Aakar will equip each VLE with the skills to build business networks and market Anandi napkins throughout their communities in order to earn a profit margin on each sale. This profit is retained within the community, thus, increasing the local money supply and promoting inclusive economic growth. This will not only create additional income opportunities for the women but also foster social change and awareness. Furthermore, Anandi­-bens, as community influencers, are expected to play a pivotal role promoting hygienic menstrual products and leading more women to join the Anandi­-ben network. The efforts of the VLEs will be complimented by advocacy with govt. departments to create markets for the supply of pads. Special focus will be given to Education and Health departments. Providing knowledge on menstrual hygiene management empowers communities to make choices in favour of their own health. Through this programme, we will raise awareness, through education, regarding menstrual health and hygiene by integrating the many contextual factors that surround it such as education, sanitation, disposal, and waste management into its creative and informative curriculum. There is lack of wider understanding of problems related to poor menstrual behaviour and the need for improved management of menstrual hygiene. Good hygiene and better health are directly proportional to each other. Poor menstrual hygiene can cause diseases like cervical cancer, fungal infections, and reproductive tract infections and can also be the reason for various urinary infections. There is a dire need to make people understand that menstruation is not solely `a women’s issue’ but is a social and human rights issue too. The Aakar behaviour change framework is designed for the girls and women, to make them prepared and understand what menstruation is and how to manage it hygienically without any shame and also how important it is to share the knowledge regarding menstruation. It also aims to include boys and men to eliminate the stigma surrounding menstruation and create a supportive atmosphere at home and schools and take initiatives at community level. PLAN OF ACTION: The workers of the mini factories will be women and the same will be involved in the sales of the sanitary napkins. This program is driven by young women, and their support is essential to run this program. School teachers, ASHA and Anganwadi workers will be involved to execute the awareness program. Awareness program will run at school and communities. Training of Trainers includes a comprehensive curriculum within Menstrual Health Management for women who have already had some exposure to the public health/menstrual hygiene product landscape. The idea is to also introduce concepts within gender norms, basic life skills, Menstrual Health, safe and healthy hygiene practices, use and disposal of pads as well as other areas that looks at building the agency of women. Here, Aakar aims to provide this training to the 15 unit workers, as well as to a minimum of 30 health workers (ASHAs, Anganwadis, ANMs) in the district. 12000-14000 women/girls getting affordable, ~100% compostable sanitary pads which will have huge effect in their health, hygiene, school drop-out rates, no work days loss & relieve from many fatal diseases. Total population of our target set up geography; Ajmer is 15.7 lakhs, consisting of 7.7 lakhs of women population. Ajmer comprises of 7 blocks in total which is further categorized into urban and rural population (7.5 lakhs). Water Aid’s Menstrual Hygiene Matters report states that globally, approximately 52% of the female population (26% of the total population) is of reproductive age and will menstruate each month, which sums up to 3.9 lakhs menstruating women in 8 blocks and 49285 women/block, each sanitary napkin mini factory set up can cater to the needs of 10- 12% of menstruating women per block. To start with we will be setting up the mini-factory in Srinagar block The total outreach through our awareness program would sum up to 3500-4000 women in and around the community. Aakar is a hybrid social enterprise comprised of Aakar Innovations and Aakar Social Ventures that enables women to produce and distribute affordable, high-quality, 100% compostable sanitary napkins within their communities while simultaneously raising awareness and sensitization of menstrual hygiene management. Aakar Innovations enables women and SHGs to produce affordable and high quality sanitary napkins, using its proprietary technology, which is then sold locally through its unit Village Level Entrepreneur (VLE) distribution model. Aakar Innovations was incubated at Centre for Innovation, Incubation, and Entrepreneurship (CIIE) at IIM Ahmedabad. In 2013, Aakar became India’s first & only company to launch a ~100% Compostable & Biodegradable sanitary pad under the brand name “Anandi”. Barefoot College etc., and corporate CSRs including, TATA International, PIDILITE Foundation, CERA Foundation, JSW Foundation and various state governments including Govt. of Gujarat, Rajasthan, Maharashtra, Delhi, Chhattisgarh etc. Aakar works on creating awareness through its non-profit arm, Aakar Social Ventures, and implements menstrual hygiene management awareness programs throughout village and slum communities. The awareness sessions aim to empower women and girls with choice and promote better health and sanitation practices. Some of the stakeholders engaged in the process include Schools, Agenais, Health Workers, Women’s Groups and SHGs and Community Volunteers. The idea is to also introduce concepts of Menstrual Hygiene, change attitudes and practices towards demand, use and disposal of pads and build an eco-system that enhances the agency of girls and women. So far Aakar has partnered with UNICEF, Water Supply and Sanitation Collaborative Council (WSSCC) a United Nations organization, WASH UNITED, ICMR-Govt. of India etc. for building and implementing year-long Behavioural change program which includes awareness curriculum on menstrual hygiene, sexual education, Maternal Health, life skills etc. Under this comprehensive approach Aakar is able to touch upon 13 out of 17 Sustainable Development Goals of the United Nations. Selected as part of Indian PM Narendra Modi’s delegation 2015 to Silicon Valley, USA & July,2016 to Kenya. Selected as Top 10 &Top 30 Innovations (indigenous raw materials for napkins & bio-degradable napkins) by FICCI, DST, Lokheed Martin, Stanford University, IUS&TF and IC2 Institute, TIE-SV 2013 among 1500+ innovations. Winner of 3rd Round of Millennium Alliance Award 2016 by US AID, UK AID, WORLD BANK, FICCI, Govt. of India etc. We are happy to announce that the manual sanitary pad factory has been inaugurated in Ajmer. Aakar Innovation is now working on setting up all required equipment in the factory and in spreading awareness about the importance of using these pads. Thank you for your valuable contribution. Thank you for the support. The Better India and Aakar Innovations has decided to set up a manual sanitary pad factory using the funds raised. While the factory will not include machinery as originally planned, the pads will continue to be bio-degradable and low-cost, and the factory will also help employ local women. Thank you all once again for the support.